Since the workplace can be a microcosm of society at-large, social rules dictate co-workers extend a few unspoken courtesies. For the most part, workplace etiquette is just the adult version of playground rules: No spitting, name calling, hitting or cursing. If you know how to do something that someone else doesn't, show him how. And no eating other people's lunches. As the saying goes -- first you get along, then you go along. This means you need to learn your company culture before determining what will or won’t be considered good etiquette. 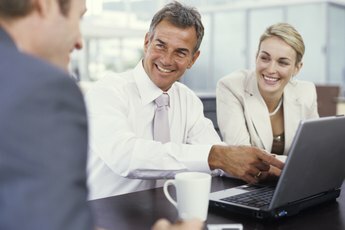 What is the communication style of your co-workers? Do people socialize in the break room or is it every woman for herself? Is speaking directly to the higher ups encouraged or should you follow the chain of command? To play well with others, you must first learn the rules of the game. The most mannerable thing you can do at work is... your job. It sounds simple, but if you do what you were hired to do -- with no excuses and few slip ups -- you’ll be on the right track. Arrive on time, meet scheduled deadlines, complete all tasks, double-check your work and be a team player. Also, don’t waste your employer’s time. Save recreational Internet use and lengthy conversations with co-workers for scheduled breaks and lunch time. For good manners at work, treat your co-workers the way you want to be treated. This means no gossiping or complaining behind anyone’s back. If you have an issue with a colleague, say so directly to her face, and even then, focus on a solution rather than the problem. Smile at your co-workers and make eye contact. Be a good listener and help out whenever possible. Compliment your colleagues often and remain vocal about your appreciation. And as far as other people’s belongings -- from staplers to sandwiches -- if it isn’t yours, don’t touch it. Since workplace etiquette extends to your wardrobe as well, follow the company dress code guidelines. If the dress code is open, adhere to a few unwritten rules: No revealing tops or too-short skirts; no clothing so tight that your outfit is a distraction or uncomfortable, or both; work heels, not nightclub heels (unless you actually work at a nightclub); light makeup; neat and clean hair and nails. It’s good work manners to keep your work and personal lives separate. Limit the amount of personal calls, texts and emails that you send or receive at work. And no matter how close you are with your co-workers, resist the urge to discuss your private life on the job. Maybe your colleagues can keep secrets and maybe they can’t --- but if your business gets out, ultimately, you told first.